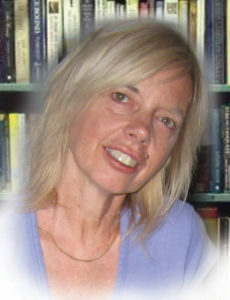 We are pleased to announce Barbara Ann Mojica as Author of the Month, December! I was born in Brooklyn, New York and grew up in Ridgewood, Queens, just three buildings up on the border between Brooklyn and Queens. As a child, I enjoyed going to school and reading lots of books. My parents did not have a car, so we did not travel much. I worked my way through Hunter College and graduated in three years with a major in history and minor in English. One of my professors nominated me for a scholarship to study for a Master’s Degree in history. Afterwards, I decided to teach in elementary school. I really wanted to see some of the places I had studied about, so I traveled all over Europe during the summers. On weekends, I hiked in the Catskill Mountains. A few years later, my then husband and I bought a vacation home near a lake in the mountains. I continued working with children earning certifications in special education and administration. I taught preschool children with special needs, later becoming a special education principal and supervisor. After a long career, I finally retired to that lakeside home to begin the next phase of my career. Along the way, I managed to raise my children and accumulate six grandchildren, including two sets of twins! It did not take me long to realize that sitting around the fire knitting was not my idea of retirement. My husband is an illustrator and writer. I began writing historical articles for a local news magazine, but I wanted to continue working with children. My husband suggested that he develop a character based on myself to narrate picture books about history for children. Voila! Little Miss History was born. My character incorporated my hiking interests, the glasses I used to wear, and my father’s huge feet in the oversize hiking boots that she wears. I would combine a love of travel and history with my husband’s artistic talents to write a series of books that make learning about historical people and events both fun and educational. Also, I would encourage parents and teachers to bring their families to these sites to experience history first hand. 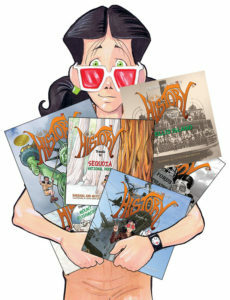 Little Miss HISTORY’S motto is, “If you don’t know your history, you don’t know what you’re talking about.” I tell children that each one of us has a story, we must study the past to help us shape the present and the future. The time varies for each book. Right now, I have released seven books in the Little Miss HISTORY Travels to…series, plus a coloring/words of wisdom/ activity book, and The Adventures of Little Miss HISTORY contains all three of my New York City books in one volume. Teachers and homeschool parents asked for that, and I was happy to comply. On average it takes six to nine months from conception of the idea to finished product. First, I choose a topic that both myself and children should find valuable and interesting. My first step is to thoroughly research the topic, adding to my prior knowledge base. That is a lot easier nowadays with the internet. Back in college, I had to visit the library and take notes on index cards. Next, I collate my notes and write a narrative outline. Then I edit my text, always putting it aside to rethink before doing another edit. I keep refining the text. This is probably the most difficult part, simplifying the message and keeping the word count somewhere between 500 and 750 words, on average. The whole process usually takes three to four months. But remember, my books are illustrated. Now, my husband Victor takes the text, plots the layout, draws and colors the illustrations. We also include our own photographs. Sometimes his ideas don’t fit my text exactly. I might have to make minor modifications to the manuscript in order to maximize the message through its illustrations. Here I consider myself lucky because most writers don’t get to work with their illustrators directly. We have the benefit of working side by side in our studio. Usually, the entire illustration and layout phase takes about three months. From there the book goes to print. I attempt to choose people and places that would interest both children and adults. My books are intended for both children and adults to enjoy reading and discover new things. They focus on well-known figures like George Washington and Abraham Lincoln but also include much lesser-known figures like Alonzo Swann and Anderson Ruffin-Abbott. Many of the books have connections with issues we are still struggling with today like human rights and immigration. In each of the books, children are asked to think about the issues and suggest possible solutions on topics like indigenous rights, slavery, immigration, and the environment. There are never enough hours in the day. When I am not writing a children’s book or historical article, I am usually reading a book to review for my blog, which I post twice weekly, marketing, or networking and sharing with my author friends. I also visit schools and do book festivals and book signings. I contribute to the quest teaching website, multicultural children’s book day, and various other blog sites. I relax at night by watching movies with my husband or doing word puzzles. In the summers, I enjoy boating and gardening. Talking to my grandchildren is always a delight and keeps me up to speed! I would sum things up in two words: patience and persistence. Despite the messages I seem to find in my inbox all the time, there is no magic bullet for overnight success. You cannot write a good book in a few hours, and there is no secret formula to becoming an instant success. Writing is a task that gives great pleasure and satisfaction to the writer. Unfortunately, hard work is not often immediately rewarded. A writer must work long hours. Most likely, there will be a lot more failures than successes in the beginning. There is always something new to learn or discover. I strongly urge writers to reach out to each other. Don’t see authors as competitors but rather as associates who can help each other reach their full potential. Thanks for sharing at Booknificent Thursday on Mommynificent.com! Tweeted!